Hiroko is passionate to show the best of Japan to you. She has learned that no matter how skillful she is in the cooking school classroom there are limitations to fully convey her messages of Japanese cooking – its techniques, philosophy, food culture and history – and the culture and beauty of her country and its people. Hiroko has determined to take students and others who have interest to Japan, so that they can be completely immersed in Japanese food culture, the beauty and history of the country and interact with the people and enjoy the nation’s unique culinary delights. With these goals in mind Hiroko began to plan and execute tours for a very limited number of participants. Hiroko conducted the first tour to Japan in 2003. The destination was metropolitan Tokyo, the historic city of Kyoto and Kyoto prefecture extending as far as the Japan Sea to the West. Due to pressing business commitments in the following several years Hiroko had to suspend further tours until she could fully commit her passion to the tour effort. In 2013 Hiroko resumed her tour and took the participants to Tokyo, Kyoto, and jewels in the mountains and on the West coast of the country including Takayama, Kanzawa and a UNESCO World Heritage Site, the picturesque and traditional village of Gokayama. Tour attendees remember the tour as a once-in-a-lifetime experience. The same tour was personalized for the group of family and operated in 2015. In 2016 Hiroko created a new tour, this time to Hokkaido at the request of previous tour participants. Hokkaido is a very different place from the rest of Japan in many ways. Of course, some of the country’s best seafood comes from its richly nourished waters and it is home of so many natural wonders of Japan, including pristine Shiretoko National Park, UNESCO World Heritage Site. Hokkaido with Hiroko runs again this year, 2017. Hiroko is now creating additional tour to Kyshu at the request of previous tour participants. Stand by/stay tuned for the announcement. Click here to learn more about the TOKYO-KYOTO-TAKAYAMA-GOKAYAMA-KANAZAWA with Hiroko tour. 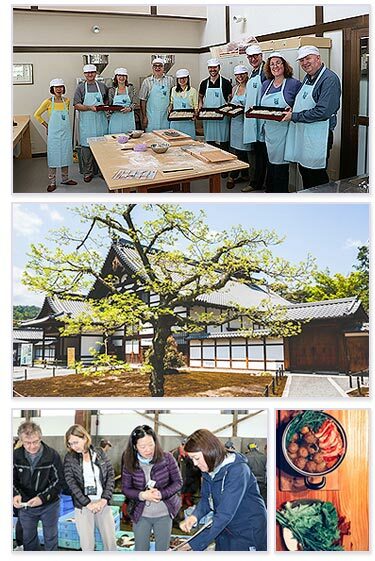 Click here to learn more about the HOKKAIDO with Hiroko tour. Here are a couple of testimonials from last years clients. I really liked that we get to see and stay at so many places. I loved horseback riding, Rausu fish market visit, tour of Rishiri Island, early morning canoe in Lake Akan, hikes in volcano crater,….almost everything. I might have enjoyed another cooking activity, but I understand that it is not necessarily the focus of the tour. I would love to go back to Japan again. Please create a new tour! I loved the hiking and walking. So much fun! Making soba was great, along with preparing the fresh fish from the market. The little family-run noodle restaurant out in the country was amazing. Liked visiting the kombu warehouse where they store trillion yen (ten billion dollars’ worth kelp)! I would enjoy learning more about other food production and preparation activities in Japan on my possible next tour to join. Possibly visiting a vegetable farm, a rice farm, a sake brewery, tea plantation, a restaurant kitchen where fine food is prepared, possibly a residential kitchen that show what’s required to prepare home-scale Japanese food, a supermarket, a winery, etc. We loved traveling with Hiroko!